Looking for new things to do with your spouse/partner, teenage child, best friend, or even co-worker? A partner band workout is a great way to get some physical activity, work on team building skills, and have fun all in one! Partner band exercises require muscle control from both parties, so you have to pay close attention to the speed and location of your partner. This workout can be done anywhere; hotel room, on the beach, at home, in your office or conference room, in the garage/driveway, etc. All you need is a band to fit your resistance level. So grab your partner and bands to try this workout! Only have the smaller round bands or have access to both types of bands? Try these other exercises you can do together. Remember to motivate your partner and hold each other accountable to do these exercises on a regular basis! Recruiting residents to participate in your community fitness offerings can be a challenge. Most communities offer a variety of standard services, classes, and programs to try to regularly engage their residents. Whether you are wanting to recruit new residents or spark some enthusiasm for your regulars, read on to learn about three nontraditional programming ideas that can help boost participation in your community fitness offerings. Fashion Show – Yes that’s right, I said a fashion show. Many residents show up to exercise in their normal clothes (dress slacks, button-down shirts and all)! While this is OK for some modes of activity, educating residents on the importance of exercising in appropriate active wear, including proper footwear, can be inspiring and quite helpful for some individuals. Contact a local boutique with active wear apparel and host a fashion show at your community while providing residents with an option to purchase what they are seeing. You could work with the boutique to allow your residents to be the models so residents can see firsthand that exercise apparel can be fashionable, comfortable, and appropriate for older adults. Don’t forget about swimwear! 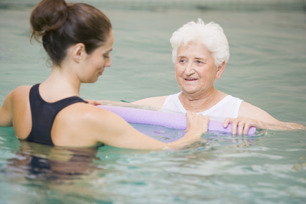 Many older adults shy away from participating in pool programming because of not having purchased a swimsuit in perhaps decades. Bring the suits, water shoes, etc., to your fashion show and remove this barrier for your residents! Philanthropic Program – Let’s face it, it can be a challenge to come up with prize ideas for residents to recognize their efforts in incentive programs that will truly get them excited. While older adults recognize the importance of physical activity for their own vitality, finding ways to ignite enthusiasm into their workout is still important to keep things fresh and fun. Connect a fitness program with a philanthropic approach instead of a traditional prizes like water bottles, t-shirts, or pedometers. Establish a community goal that if residents come together to achieve X minutes of walking or attend X number of group exercise classes in a month, the community will make a monetary donation to a local charitable organization. You could even include a canned food donation requirement as an entry fee to your group exercise classes for the month. Chart the residents’ progress through the month so they can see how they are doing and they can recruit their friends and neighbors to participate. Educational Lectures – Well qualified fitness staff with an educational background in health and fitness can contribute more to resident wellness than exercise instruction alone. Tap into this educational background and recruit your fitness staff to share their expertise and educate residents on a variety of health and wellness topics on a regular basis. This can help some residents begin engaging with the fitness staff in a way they may otherwise never do if avoiding the fitness center. When your fitness staff can demonstrate that they are knowledgeable about various health conditions or other resident interests, they can begin building trust and relationships that will hopefully translate into engaging that resident in the appropriate fitness services for their needs. Find out more about how NIFS provides these ideas and others through wellness consulting at senior living communities. Or, check out how one client uses NIFS wellness consulting for better marketing outcomes in her communities. You're senior living community is missing out on some important benefits if you don't have detailed data from your fitness program. Read on to find out what you stand to gain by getting smarter about gathering and using data from resident participation in the fitness center and group exercise classes as well as evaluating resident participation in fitness center appointments and services. Before we jump into benefits for the community, the fitness program, and the residents, we should note that the most common obstacle for communities digging into data is having a dedicated point person who can regularly support this effort on an ongoing basis. While tracking this data is not rocket science, it has to become part of the fabric of your fitness program in order to be effective. Certainly, a full system for this type of effort is part of what we bring to the clients we serve. Although it can be a challenge to determine the return on investment your fitness program is lending to your community, regularly tracking participation levels and establishing target goals for the program can provide solid stories that your marketing department can use to attract prospects. As you embark on setting up a data collections system with your fitness center staff, pull in your marketing team to find out what they think might be most helpful for their campaigns to reach out to prospective residents. Ready…aim…fire! Without regular participation data to evaluate when deciding on your next fitness program, you may as well step up to pull the trigger and go straight from “ready” to “fire” without an opportunity to aim. The aim should involve looking at ebbs and flows in visits to the fitness center or participation levels in classes and creating targeted programs to increase the number and frequency of participants. Without the opportunity to aim, it will be more difficult to anticipate your residents’ needs. Even worse, don’t keep a poorly attended program running just because you’ve always offered it. I guarantee you have at least one class on your monthly calendar in which participation has trickled off in recent months or even years. You may be saying to yourself, “Yes, but those three participants still really enjoy the class.” While that may be true, you may be neglecting a dozen more residents who have a desire for a different class while you are pouring resources into a sinking ship. Allow participation data to be a free resource to advance your community fitness program by allowing your staff to aim toward meaningful goals and hopefully more effective programs. The greatest benefit of all from tracking participation is how it can better serve the residents of your community! Everything that was stated in the previous section on benefiting the staff will of course carry over to benefit the residents through more meaningful program options. By tracking participation data, your fitness staff will be able to further evaluate who is coming to different classes or visiting the fitness center and how often they are doing so…and conversely, who is not! 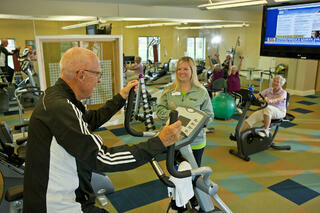 This is truly where relationships are made between the fitness staff and residents! For example, the fitness staff will have the ability to note whether a three time per week balance class participant suddenly isn’t coming. A follow-up phone call to a resident noting their absence and welcoming them back makes a huge impact in resident adherence and satisfaction. Furthermore, targeted membership campaigns can be tailored to attract residents not currently participating in the program. Without the data to regularly report who is coming to what and when, these outreach efforts to residents would not be possible in a strategic and effective manner. We can help your community get started developing these data practices through NIFS consulting services. Click the link below to find out more about this cost effective and impactful offering. The wellness staff you provide for residents in your senior living community can, quite simply, make or break your resident wellness strategy. Hire only for qualifications, and you may miss the mark on a personality that works for the residents. Hire with a primary focus on personality ("we can teach the hard skills, but you can't correct for personality") and you may never really get your services off the ground. Recently, I wrote a blog about our hiring tips. We're a staffing organization, so we do a lot of hiring to support senior living community wellness programs. 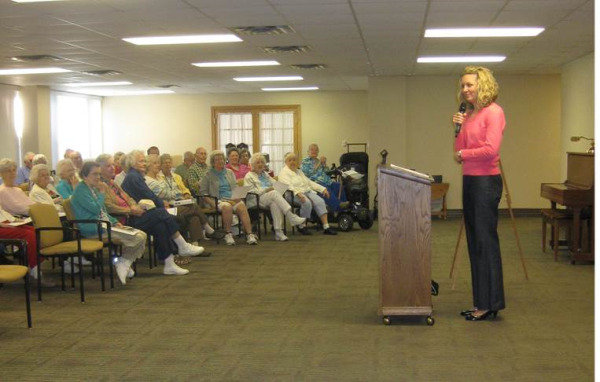 We also provide wellness consulting for retirement communities. What I've seen from both ends of our work is that hiring incorrectly can significantly shortchange your active aging initiatives. Fortunately, the converse is also true - hire well and your community can edge out its competition by providing a vibrant resident lifestyle. Determine the qualifications for the job. Effectively post the job opening. Develop a more in-depth interview process. If you want to cut to the chase and access all four of our Build Vitality webinars, click here. Are you sad that summer is coming to an end or getting bored with your workouts and just need a change? Taking advantage of the warmer weather is a good way to challenge your body and try different exercises outdoors before it’s too late and the cold winter months keep us all inside. I bet you pass several landmarks and unique open areas every day on your way to & from work that could be used for your next workout. Do me a favor and get creative the next time you are on your way to work or school and find a public place you can run stairs and a bench you can do lunges and tricep dips on. Living in downtown Indianapolis there are a lot of very cool locations I’ve found to create my own outdoor boot camp workouts. I love to exercise outdoors but get tired of running all over the city (it’s not that large), so I started adding other things in and I’ve even got a few of my friends to try it with me! Yes, some days it’s hot & humid and it can be exhausting but you can always give it a try on a spring or fall day to get out of your corporate wellness center for a change of scenery. Here is one of my favorite workouts to do, so get creative and find locations near you! Watch our videos for demonstrations to take this workout outdoors. The heat index is approaching 100 degrees, and its only 8am. You are sick to death of running on the treadmill at the gym and want another option to burn some calories and improve your cardiovascular endurance. Well, my friend, have you considered the pool? You don’t have to be a swimmer, have fancy equipment, or even be coordinated to get a great workout in the pool. Aquatic exercise is perfect for all ages and ability levels, due to the adaptability of the aquatic environment. In basic terms, you get out of it what you put into it. The more effort you give the more resistance the water provides, and this increases the difficulty level of your workout ten- fold! The workout below can be done in shallow water, or if you are more adventurous, grab a noodle or an aqua jogger belt and try this in the deep end! Now repeat the above exercises for a 15 count each, and then a 20 count each. You can repeat this circuit 2-3 times, and add arms to each exercise for an extra calorie burning boost! Did you know that you can exercise your abs every single day of the week? Normally with strength training, you should wait 48 hours before lifting with those same muscles again—however, since the abdominal muscles are made for endurance by performing jobs like supporting posture and breathing, they can be worked all 7 days of the week! If you are particularly sore after an ab workout, still use your best judgment, and delay working them until the soreness is gone. Even though it only takes a few minutes to squeeze in a great ab workout, it’s easy to skip that portion of your workout when you are already tired. Below is a 10-minute workout to really target the ab muscles for toning and strength in your corporate fitness center. If you are at a beginner level, shorten the workout by performing 30 seconds of each exercise, for 5 minutes total. Whether we like it or not, we have an epidemic on our hands. Whether you are overweight, obese or not, classifying obesity as a disease will affect you, if it hasn’t already. Changes are in order. Simply classifying obesity as a disease does not make the necessary changes automatically occur and I’ve already expressed my concern with the direction I think this could go. Fructose is processed in our bodies similarly to ethanol (alcohol). Actually, chronic consumption of fructose shares 8 of the 12 side effects of chronic ethanol consumption. Fructose is like alcohol without the buzz. How do you make alcohol? Ferment sugar! Due to the fact that fructose consumption has no immediate side effects, the government will not regulate it. When the government won’t step in to make necessary changes, it becomes our responsibility. In 2007, Yale University published a meta-analysis of 88 cross-sectional and longitudinal studies looking at the effects of soda consumption. They reported that consistent soda consumption correlates to an overall increase in average energy consumption (we eat more), increased body weight, decreased milk and calcium consumption, and decreased consumption of adequate nutrition. This even included studies sponsored by major soft drink companies, which had consistently smaller correlations vs. the independent studies. When the companies won’t admit fault and make changes, it becomes our responsibility. We must make the changes. The supply won’t budge until the demand changes. What are some things we can do? Lead by example. Our friends, family members, kids and our kids’ kids will learn and copy from what we eat and drink. Adopt a lifestyle of healthy, whole foods and consistent exercise. Get rid of sugar-sweetened beverages. Fruit juice, Soda, Gatorade. Wait, fruit juice?! Isn’t that good for you? Fruit juice is basically sugar and contains no fiber, unlike fresh fruit. In 2008, a nurse’s study linked fruit juice consumption to type 2 diabetes. Increase your fiber intake. Eat FRESH fruits and veggies. This helps lessen your insulin response, especially when eating carbohydrates. A more controlled insulin response reduces your chances for fat storage and type 2 diabetes. Wait 20 minutes before getting second helpings. Leptin, a hormone responsible for telling our brains we are full, takes time to respond. Buy your screen time with activity. Minute for minute. This is a hard one but will help to increase your activity levels. Screen time includes: computer, TV, texting and video games. Drink more water. General recommendation is at least half your body weight in ounces each day. Control your immediate food environment (food in home, at desk, etc.). If the “bad” food isn’t in the house, we’re less likely to eat it. When grocery shopping, keep two things in mind: stick to the grocery list and shop around the perimeter. Only go to the middle aisles for specific items on your list. Be aware of serving sizes, especially when we splurge. The average size of the classic Coke has increased from 6.5oz in 1915, 12oz in 1960 to 20oz in 1992. It’s ok to occasionally enjoy the good things in life but be very cautious not to overindulge. Have blood work done on a regular basis. Know your numbers! Exercise! Why is exercise important, especially in obesity? I’ll give you a hint; it’s actually not the number of calories you burn. If you missed parts 1 and 2, go back and read Is Obesity Really a Disease and How did we get overweight?